Today as I headed to Cordoba (my home for the next two nights), I caught a train to Madrid, took a subway train to another station across the city and on to another train bound for Seville. To be humbly honest, I was pretty nervous about it all, because as I’ve said, my Spanish is minimal (and it’s Mexican Spanish at that) and it is rare that I have found anyone who even speaks a little English. Add to that my observational skills seem to lean more toward beauty and humanity rather than to logistical details – well, I’ll confess, my confidence was lacking. I know that several reading this don’t believe in the power of prayer or in having a relationship with God, but I do and I totally turned my navigation over to my Shepherd. It wasn’t one and done, because fear crept in, but each time I “let go and let God”, I felt immediate calm. And I made it to Córdoba!!! This may be my favorite city yet – which is saying a lot!! 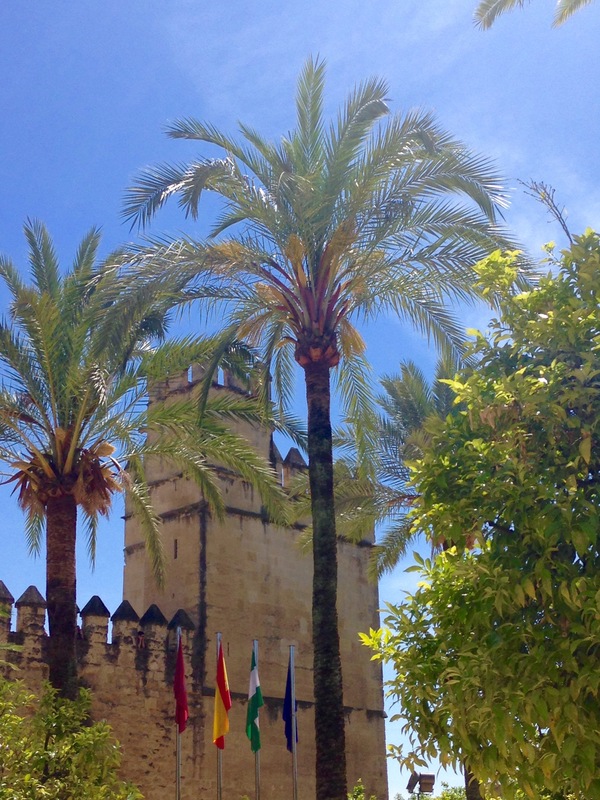 Córdoba was an important Roman city and a major Islamic center in the Middle Ages. It’s best known for La Mezquita, an immense mosque dating from 784 A.D. I made my way through one tiny, winding street after another, over the massive Roman Bridge and by a number of impressive historic buildings. Then I headed in the opposite direction and happened upon legions of clothing, shoe (they do love their zapatos here in Spain) and pastry shops as well as many bars/cafes. I did not find a grocery store which was my goal, but did come across a very cool Mercado with many stations of a variety of prepared foods and it was hoppin’. Lots of people out and about for a sunny, 80 degree Tuesday afternoon! I tell you what though – I AM POOPED!! All this navigating is exhausting!! !